The 34.5-pound silver-and-nickel alloy trophy — there’s only one, although its shape and size have evolved since it was first awarded in 1894 — annually goes to the National Hockey League championship team, whose members drink champagne out of the topside bowl. Since there’s only one Cup, teams don’t get to keep the trophy, although the team’s name is engraved along with those of other champions. So it’s a sporting icon and for hockey fans, truly something special. 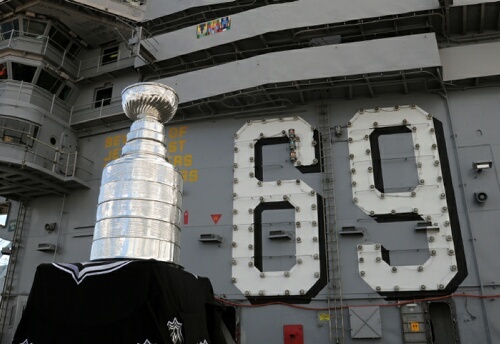 More than 200 sailors and shipyard civilian workers had their photos taken with the Cup. Pretty safe to assume Snaza was one of them.